A lodge of evil magicians. A plan to steal every child from the face of the earth. Fr. Richard Kinney is having a crappy week. He’s not at all sure he’s the best leader for the demon-hunting Berkeley Blackfriars, his boyfriend has just broken up with him, and his last exorcism did not go well. Kat Webber is in over her head. After discovering her brother’s comatose body in the midst of a demonic ritual, her heart sinks as she realizes he was up to something sketchy…maybe even evil. 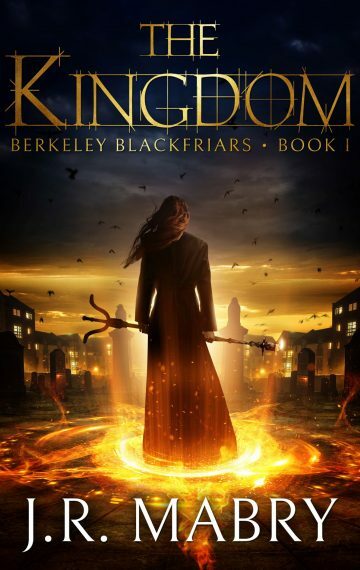 Reaching out to the Blackfriars for help, Kat and Richard uncover a lodge of evil magickians who make every avocado in the world disappear—then every dog. It’s a race against time as Kat and the Blackfriars try to stop the magickians from eliminating their next target—every child on earth. Fans of Buffy the Vampire Slayer, Preacher, The Dresden Files, and the Mercy Thompson series will love this spine-tingling yet humorous supernatural suspense novel. Scroll up to buy or borrow, and enter The Kingdom today! WARNING: This book contains adult language and sexual situations. Not appropriate for children or people who are easily offended!